The Forspeed has a wind deflector with integrated photovoltaic cells that feed solar power to the on-board electrical system. STUTTGART -- Daimler AG's Smart microcar brand will unveil the Forspeed study for an electric roadster at the Geneva auto show next month. Smart said it created the Forspeed to show that driving a green car with no emissions can be fun. The concept has a range of 135 km (84 miles) and is powered by a 30-kilowatt electric motor installed at the rear of the car. Smart boss Annette Winkler said the brand has no plans at the moment to build the Forspeed, but the concept gives an outlook on the brand's future design language. 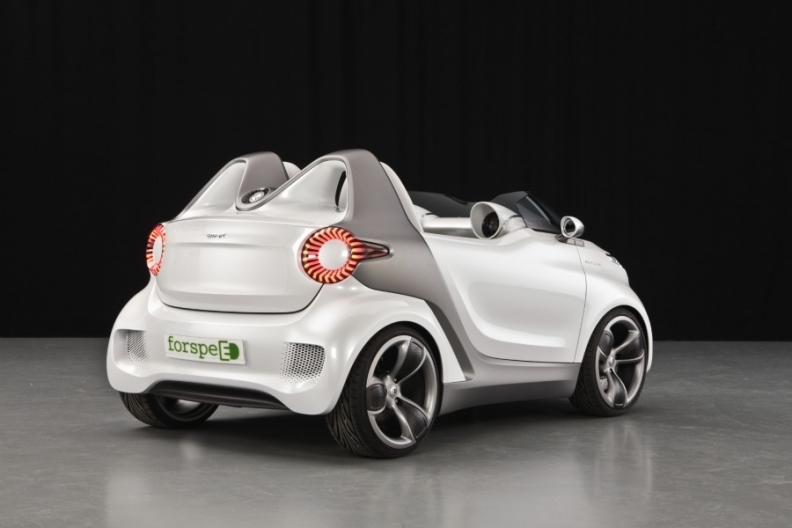 "Some design elements will be seen in series production models," Winkler told Automotive News Europe, adding that the Forspeed "reinforces the positioning of Smart as a think tank for the electric mobility of the future." The Forspeed is made from lightweight glass fiber-reinforced plastic and has no roof or side windows. Instead of a windshield, there is a low wind deflector with integrated photovoltaic cells that feed solar power to the on-board electrical system. The car's interior can be protected against bad weather by a stretchable cover. Unconventional features on the concept include the lack of door handles. The doors are opened with an interior grip. 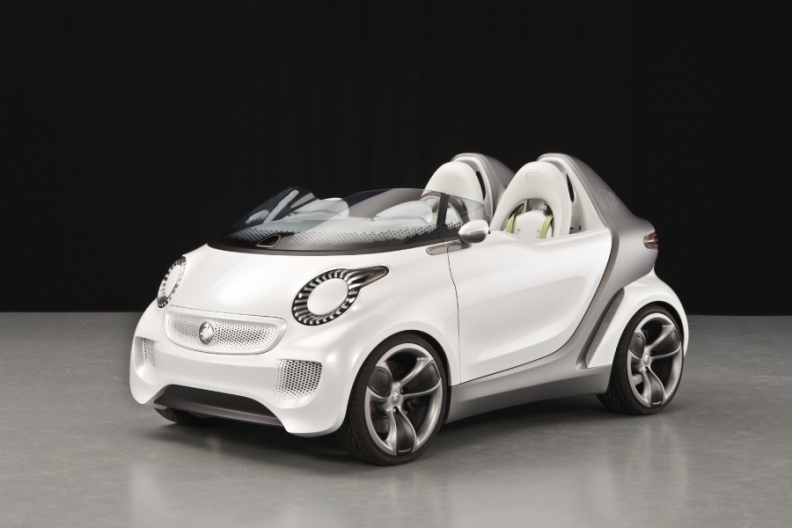 Gorden Wagener, head of design at Smart parent Mercedes-Benz, said the Forspeed newly interpretes the former Smart brand slogan "reduce to the max." The concept is "young, trendy, puristic, but beautiful" with modern features that make it like an "iPhone on wheels," Wagener told ANE. The Forspeed's interior is inspired by an aircraft cockpit with the driver and passenger seated in front of separate instrument clusters. The passenger side has a smart phone that can be swivelled by up to 90 degrees in its holder toward the driver so the driver can also take a look at the navigation system display. The Forspeed accelerates from 0 to 60 kilometers per hour in 5.5 seconds and reaches a top speed of 120 kilometers per hour (75 mph). The Forspeed has an electric drivetrain in the rear. Smart has sold an electric version of its Fortwo two-seat microcar in 18 countries in Europe, North America and Asia since 2009.